A leather scented candle may help bring out the wild biker or cowboy in you. At the very least, it will remind you of the fresh smell of a new car. 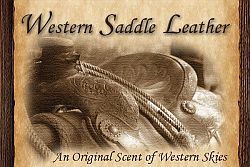 At Western Skies, their leather candle version is called Western Saddle Leather. If you’d like to try making your own leather scented candle, here are a few candle suppliers that sell the fragrance oil: Nature’s Garden Leather Jacket fragrance oil (black dye would work well), Leather Store by Candle-licious and Leather by Saratoga Scents. If you’re feeling daring, consider blending the oil with patchouli, sandalwood or cedar. A leather scented candle sounds interesting. Making your own candles can be quite messy and time consuming. Why not just check out some candle websites and find the scented candles you are looking for.